A mob of angry Chinese students protested at Massey University yesterday after Chairman Mao was lampooned on the cover of the student newspaper. Students likened the cover of Chaff, which this week satirises women's magazine Cosmopolitan, to the anti-Muslim cartoons circulated around the world in February. Tempers flared outside Massey's library as about 50 Chinese Massey and UCOL students and a Chinese lecturer confronted Chaff staff. Students said the issue is racist and the last straw, as many have also suffered verbal abuse on the streets of Palmerston North. UCOL student Xing Tang said Chaff staff are ignorant of Chinese culture. 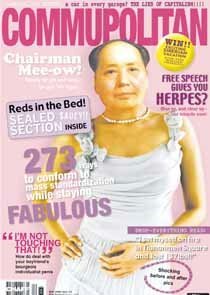 "Chairman Mao is like Jesus to us," he said on the verge of tears. "We pay $20,000 in fees and a Musa fee (which funds Chaff) and this is how we are treated." Student Ronnie Cao likened the cover to the anti-Muslim cartoons. "This is discrimination against us." It will have a huge effect on New Zealand's reputation, Mr Cao said. Yang Chenglin said students are proud of their Chinese culture. "Mao gave us independence. He's no more a killer than George Washington or George W Bush. "He is the father of China - without Mao, there is no China." Mao Zedong, or Chairman Mao, was the founder of the People's Republic of China and one of the most prominent figures in Chinese history. He is also revered as a great spiritual leader and cultural symbol. Students gathered in tight circles outside the library yesterday, signing a petition demanding an apology. Students also want remaining copies pulled out of circulation. Massey University finance lecturer Fei Wu, who's Chinese, said students deserve an explanation. "This shows no respect to our people. "There are 1000 Chinese students here who spend a lot of money to study here and this is an insult. Massey University international office director Bruce Graham said the Chaff cover is in "extremely poor taste". However, he accepted Chaff has editorial independence. Mr Graham has suggested to Chaff an apology is required. Russians protesting the depiction of Stalin? Germans protesting the depiction of Hitler? I hope Chaff does not / has not apologised. That would really piss me off.